I was reading something recently that explained a phenomenon that occurs when we are lost in an area without landmarks: when we are lost and try to walk a straight line, we will undoubtedly veer to one side or the other and find ourselves right back in the same place where we started. Some circles might be small, some might be larger and take longer to get back to the starting point. But, it is almost a rule. Without some way to guide ourselves, without some landmark or way to focus on a path (and sometimes even in the presence of these things) we come back around to the beginning. How telling is this? I can tell you parents often feel “lost” having walked in “circles.” Sometimes it even comes in the form of “is this the best it gets?” which suggests we have gotten to a point where there is not a way out; that we should just camp out in the woods and consider ourselves lucky that we found some nuts and berries along the way (or simply consider that our children will never learn to behave differently). One more story, then I will get to my point. I once found myself lost in deep woods (flooded at that) with a friend who was much more seasoned in getting out of strange places than I (he graduated from a military institute and would not be found dead without a compass). He said, “the way out is that way” (pointing ahead, but looking at his compass). Pick a tree along this line and walk to it. Once we get there we will pick another tree along the line and repeat the process until we get out.” Brilliantly simple. 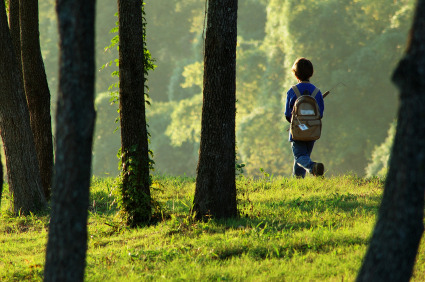 In changing behavior, we need to pick “trees,” guiding points, so we don’t walk in a circle. We have to stay focused not only on the goal (the edge of the forest), the direction we have chosen (the compass heading), but also check-points along the way. Sometimes I think we find the line, have the direction, then forget which tree we were walking towards because we finally had a way out, confident we were going to change things, but not diligent enough to keep our eye on the tree or even the compass. If you come up with a plan for changing a certain behavior, have check-points. Review your implementation of the plan frequently enough to make sure you stay on course. Think about how the behavior has changed (or not). Check your line. Use me and my posts if your compass seems a bit off. This entry was posted in Uncategorized and tagged consistency, prevention, teaching by BehaviorBandAid. Bookmark the permalink.